Lead Lined Doors | Lone Star X-Ray Shielding, Inc.
Lone Star X-Ray can manufacture two types of lead core woo d doors, wood veneer faced doors and plastic laminate wood doors. 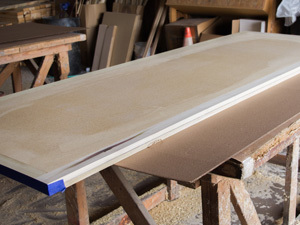 Wood veneer doors are constructed to support the placing of sheet lead in the core, up to a thickness of 3/8”. The doors are designed to permit the normal hardware setup, performance and appearance of unlined wood doors while providing crucial radiation protection. Lone Star X-Ray constructs these doors using two sheets of particle board or stave lumber sheets which are separated by a sheet of lead. The lead is located in the center of the door and extends to all edges of the door. The core of the door is fastened together with steel bolts, nuts and washers, while the rest of the door is fatstened with lead dowels. To ensure shielding protection the bolts and nuts and washers are covered with poured lead. The door is smoothed to a uniform surface before veneer is applied. Lone Star X-Ray can also manufacture its lead core wood doors with a plastic laminate finish available in a variety of colors.